Komnata Quest does a fantasy walking promenade tour and do various escape rooms all of which are so unique and fun. We and other guests on the night got to experience an interactive performance tour like no other. Everyone will be given headphones and our actors will bring their magic to the performance. You will meet peculiar people who will tell you exciting things about this city. You will help solve a mysterious crime and dance in the streets of Covent Garden. What is the hearts of houses? Who lives behind the black window? How can we understand goblins? Group size consist of 1-15 people and lasts 90 minutes. They have several escape rooms in London Drury Lane all of which are unique. We of Love Pop Ups London got locked in the Dungeon of Saint Angelo’s Castle which is a place of great horror as 1,000’s of innocent victims of the Great Inquisition spent their last hour in that very dungeon. Every prisoner at that time was sentenced to capital punishment but all was given the chance to save their own life. They were each locked in this dungeon filled with puzzles and mystical secrets for one hour. If they were unable to make it out, they were killed in the most horrible ways. Historians say that only one person managed to escape this gloomy place. He was a sculptor that reached the heights of the jewel craft. No one else has been able to make it out. The spirits of Saint Angelo’s Dungeon now awaits for others. Will you be brave enough to step into the dungeon like us and try to escape within an hour? To find out more about Komnata or to make a booking click here. Thanks to Komnata Quest who let some of the community of Love Pop Ups London come down to discover and play one of the most thrilling tours in Covent Gardein and explore their most scaiest escape room. Read all blogs/reviews from the comments section below. The quest began at Charing Cross with headphones lit up with green lights and a tour guide. Once we were all good to go, we set out on the hunt to learn more about Covent Garden with a our leader guiding us though the back streets. Cue an immersive performance with jelly beans, magic boxes and dance. Overall, It’s certainly a fun way to learn more about Covent Garden. I personally would recommend the tour for families with young children, as I think the magical elements would really interest them. Komnata is well known around the world for their escape rooms and now they brought a unique experience to London in the form of a promenade performance called The Heart of Covent Garden. Everyone was given headphones and an actor performs well we walked all over Covent garden. It was wonderful. This is my first Komnata experience. 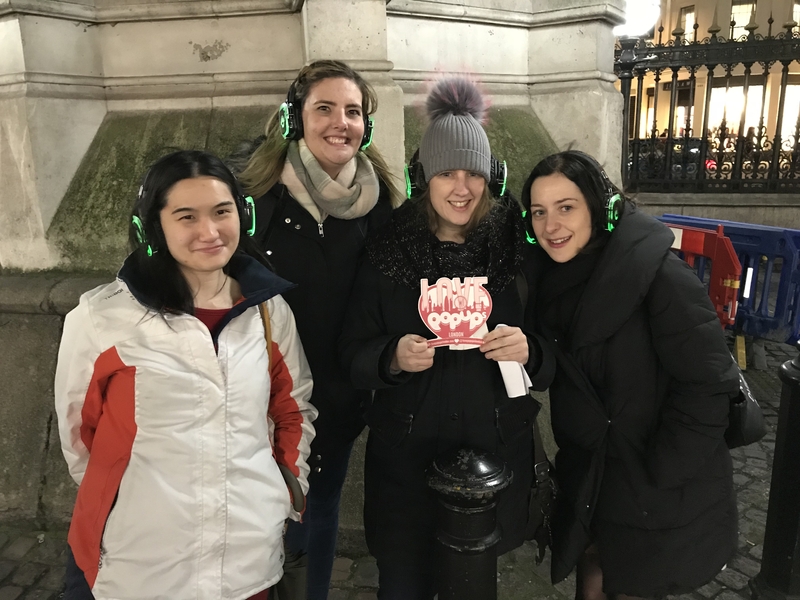 The Heart of Covent Garden started out in Charing Cross with us receiving headphones that lit up with green lights and a tour guide. It was an immersive experience with instructions and the story being delivered over audio as the guide acted out the parts and provided complementary visuals. There is a lot of exploring Covent Garden, fun, magic, laughter and dancing. You follow a story line where you have to discover who stole the heart of Covent Garden. Expect a lot of walking and a fun way to tour the area! A simply brilliant escape room, certainly one of the hardest I’ve ever tried. On arrival, we were greeted by monk and ordered to don robes and to transport ourselves into the experience. Once suitably dresses as nuns we were ordered to not speak and to walk in a line to realise our fate – death by Saint Antonio, if we failed to escape. Did we escape…? Well that would be spoiling it, but let’s say it was a close call. One of the most atmospheric escape room I have tried in ages, did we escape? Read my blog to find out more. This escape room has all you could want in a room and more. Without giving to much away this room will get your adrenaline pumping and will definitely give you a few jumps. If you are easily scared then I wouldn’t recommend this room. The puzzles were difficult, you need to think outside the box for this one. I loved it and if you e done a few then definitely do this one but if you are a newbie to rooms then rather build up to this one. Love escape rooms, love horror, love Frankenstein then you’ll love this atmospheric escape room.